The KNDK Law Firm is situated just on the Missouri side of the Missouri-Kansas state line. As Kansas City personal injury lawyers, we’re used to helping clients with legal claims in both states. This is the first of a series of articles comparing different aspects of Missouri personal injury law to Kansas personal injury law. There are some important differences between the states’ laws. Sometimes there is no choice about whether to file a case in Missouri or in Kansas – but sometimes that choice does exist, and the applicable law becomes very important to that decision. Comparative fault is often a defendant’s main effort to defend against a personal injury negligence claim. The effect of comparative fault is to let the defendant try to show that other people or companies – including the injured person (the plaintiff) – were responsible for causing the plaintiff’s injuries and damages. Every percentage point of fault the defendant can move onto another party equates to less of the damages that defendant will have to pay. So defendants fight very hard to be able to point the finger at others, including you as the injured person. This can directly affect your recovery. The Missouri comparative fault system follows a more traditional “pure” comparative fault. Suppose the plaintiff proves damages of $100,000. If the jury finds the defendant is 80% at fault and the plaintiff 20%, the plaintiff could recover $80,000 from the defendant. If the defendant is found only 30% at fault and the plaintiff 70%, then the plaintiff could still recover $30,000. But the Kansas version of comparative fault works differently and is harsher on the injured party. The fault comparison works the same until the plaintiff is found 50% or more at fault. 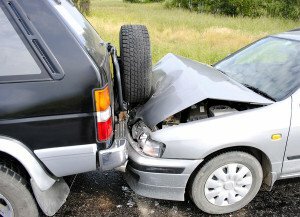 If the plaintiff’s fault in causing the injury is assessed by the jury to be 50% or greater, then Kansas law does not allow the plaintiff to recovery anything – the injury claim is barred, no matter how significant the injury. This law is found at K.S.A. § 60-258a. So in our example from above, if the jury values the damages at $100,000 and divides the fault 50-50 between the plaintiff and the defendant – the plaintiff recovers nothing in Kansas, but would still recover $50,000 in Missouri. This clearly demonstrates that the outcome of a personal injury lawsuit can vary greatly depending on which side of the state line it occurs. KNDK’s team of Kansas City attorneys always looks for ways to work within the laws of the applicable state or states to help position our clients to be able to recover the maximum damages possible for their injuries. Let us see if we can help you as well.